The MARTINI DIVA: LEMON BASIL MARTINI - Herb based Martini with a twist! LEMON BASIL MARTINI - Herb based Martini with a twist! I planted some lemon basil in my herb garden recently, an herb I love using for cooking chicken and fish especially. When I was chopping it the wonderful lemon aroma wafted up to my nose and I suddenly thought what a nice herb martini it might make. I was right! 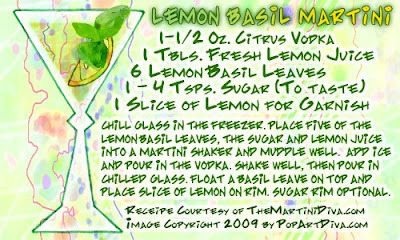 These Lemon Basil Martinis are delicious and they're a great starter for a nice entree that also features Lemon Basil. I know many of you are thinking, "basil martinis?" but this is lemon basil, a much less aggressive herb than the more common sweet basil, the foremost flavor note is lemon! Try one, I think you'll like it! If not you can use the martini as a marinade for the chicken or fish!